R.E.S. can offer customised PC's for your business or personal use. If you are looking for new systems then we can advise and build them to your specification, allowing for future growth. 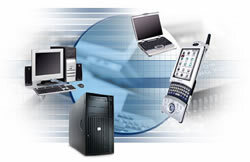 We can also supply complete PC solutions. This means both the hardware and software (both operating systems and applications) that your business will need to operate efficiently. R.E.S. network division specialises in Small to Medium size businesses in the Northwest area who are looking to install or maintain a Local Area Network (LAN). No job is too small, so please, do not be embarrassed to contact us. If you are contemplating your first networking system, want to connect just two computers, or are changing location or upgrading at your existing site, R.E.S. can advise, build, maintain and support a network infrastructure for you. Acer - Success Built to Last. Acer provides rock-solid technology to power the growth of your business, and is committed to delivering a full range of hardware and software products to meet the demands of today's business environment. Whether your workforce requires mobility on the go, dependable desktop solutions to streamline work efficiency, or secure and reliable computing solutions available 24/7, Acer provides a complete product range of notebooks, desktops, servers, monitors and projectors that meet your objectives. Bitdefender Internet Security - A solution for every need. Whether you need protection for a single device, a smart home, your small business, hybrid infrastructure or Enterprise datacenter, Bitdefender has the product that delivers the best security, unparalleled performance and incredible ease of use. Tough on threats. Always up-to date protection ensuring you’re protected against the latest threats and exploits. Trusted to be ahead. With a worldwide network of 500 million machines, Bitdefender has the largest security delivery infrastructure on the globe. Performing 11 billion security queries per day, Bitdefender detects, anticipates and takes action to neutralize even the newest dangers anywhere in the world in as little as 3 seconds. Innovation has earned Bitdefender the trust of families and corporations from over 150 countries and has won a wealth of awards. Zen Broadband - the award-winning broadband service from Zen Internet. Zen Internet provides a range of high quality award-winning Internet services for the business and home user, from the latest in high speed DSL and Fibre-based Broadband Internet access to IP VPN solutions and leased lines. R.E.S. is a Platinum Reseller for Zen Internet and, in addition to the Internet connectivity solutions above, can provide domain names and Web hosting packages, dedicated servers and managed hosting, managed network security, and state of the art Website design. We can also supply Business Talk and Business Talk Plus from Zen Internet - Zen's own landline and calls service for businesses – from Small Office/Home Office to larger Enterprises.